Two robbers hit Tony's Italian Beef, 7007 South Pulaski, making off with more than $175 cash. The crime occurred at 9:48 p.m. Wednesday, February 6, minutes before closing time. One thug jumped over the front counter, waved a black handgun and order the three employees to the back of the restaurant. The other criminal pulled a security gate over the front window, ran inside and locked the front door. After grabbing the cash, the pair fled on foot out a side door leading to the parking lot. The robbers were described as black men age 25-28, 5'10 to 6'0 and 140-150 pounds, medium complexion. A home-invading thug attacked an 83-year-old Ashburn man, breaking his left shoulder and stealing his wallet and about $200 cash. The crime occurred at 5:45 p.m. Thursday, February 7 at the victim's home near 82nd and Springfield. The victim heard his side doorbell ring. When he answered it, he saw the offender there, posing as a good samaritan. The offender claimed that the victim's garage had just been burglarized. When the two walked out to the garage, the victim saw nothing wrong with the garage but did see a basement window broken. The offender claimed that he saw who did it and would stick around to give a description to police. He advised the victim to go inside and call 911. As the victim stepped back into his house, the thug pushed him hard from behind, knocking him onto the hallway steps. The criminal stepped over the victim and closed a door, attempting the trap the victim on the staircase. The man got to his feet, opened the door, grabbed a can of pepper spray and attempted to disable the thug; but the crook swatted the can away and pushed the victim onto the floor of a bedroom. He used an extension cord to try and lock the victim in the bedroom but was unsuccessful. The victim emerged from the room to confront his attacker again. "Where's the money at?" the invader demanded as he knocked the victim down a third time. As the victim lay on the floor, the thug went through his pockets, fleeing out the front door with the wallet and $200. The victim then called 911. He was treated by CFD paramedics for lacerations to his head, left arm, lower left leg, and right hand. He was transported to Christ Hospital, where x-rays confirmed the broken shoulder. The home invader was described as a black man age 30-40, 5'9 and 200 pounds, brown eyes, dark complexion, wearing a black hoody. A 34-year-old West Lawn man said he was shot in the finger as he walked near 63rd and Keeler with a friend. The crime occurred at about 9:30 p.m. Saturday, February 9. The man and his friend, a 49-year-old Evergreen Park man, said they were walking to a store when they heard two or three gunshots. The victim felt pain and saw that his left index finger was bleeding. He and his friend jumped in the victim's SUV, and the victim began driving at a high rate of speed toward Little Company of Mary Hospital in Evergreen Park. On the way they were curbed at 71st and Kedzie by CPD. They explained their predicament, and police made the victim and his friend switch places, so that the injured victim would not be driving. They then proceeded to the hospital. Burglars forced open a side window of a basement apartment near 50th and Keeler and stole an iPhone, and iPad and another PDA, and $150 cash. The crime was discovered by the victim, a 33-year-old woman, at 3:00 p.m. Saturday, February 9. Two thugs grabbed cellphones from a 22-year-old Chicago Lawn man and his 21-year-old girlfriend (of Archer Heights) when they were passengers on a northbound CTA bus at 44th and Cicero at 4:40 p.m. Friday, February 8. Immediately after the crime, the criminals jumped off the bus and fled east on foot. They were described as black men about 20 years old. Burglars forced open the back door of a home on the 7900 block of south Kolmar and stole a video camera and assorted jewelry. The crime was discovered by the victim, a 62-year-old woman, at 5:00 p.m. Wednesday, February 6. Want to work directly with Chicago Police to prevent crime in your neighborhood? 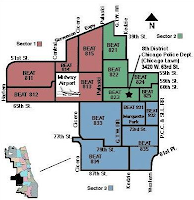 If you live in Beat 812 (see map), come to the Clearing Branch Library at 7:00 p.m. Wednesday, February 13. If you live in Beat 814, come to Vittum Park at 7:00 p.m. Thursday, February 14. 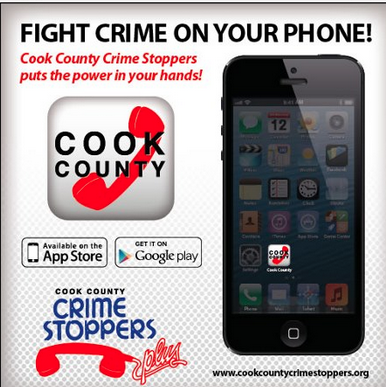 Hear updates on crime in your neighborhood and learn how you can work with neighbors and police to make the community safer and better for all.